Viral exanthem, also known as non-specific viral rash, is a rash caused by a viral infection. Many viruses can cause a similar-appearing rash, so it is difficult to tell which one is the culprit. Age, duration of illness, and other symptoms may suggest which virus is the cause. Respiratory and stomach (gastrointestinal) viruses are common causes of such a rash. 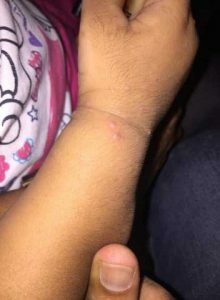 The causative viruses for chickenpox, measles, rubella, roseola, erythema infectiosum (fifth disease), hand foot and mouth disease and a number of other organisms cause distinctive patterns of rashes and prodromal symptoms. When there are no characteristic lesions and/or distinctive prodromal signs and symptoms, analyze of a specific cause may not be possible. Many exanthems are associated with common winter and summer viruses including respiratory and enteroviruses. A widespread rash of pink to red spots or bumps occurs primarily on the trunk, arms, and legs. The rash may or may not be itchy. Sometimes, the person does not feel well and might have a fever, fatigue, headache, loss of appetite, aches, and pains, and irritability. In some cases, the skin disease as part of a constellation of other symptoms may indicate a specific viral etiology. All patients presenting with a suspected viral exanthem should be evaluated with a thorough history (including onset of symptoms and exposures and affected contacts) and review of systems. A physical exam should include the oral mucosa, as some viruses have a characteristic enanthem. If the presentation is severe or the patient is in a high-risk group (especially pregnant or immune compromised), analyze testing should be undertaken. Viral exanthem is common in children and young adults who are not yet immune to a number of common viral infections. When an adult gets a non-specific viral rash, it might be caused by a drug reaction. 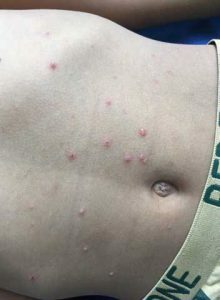 The virus is highly contagious from one to two days before the rash appears and until all the blisters have formed scabs. It is spread by airborne respiratory droplets or through direct contact with blister fluid. The incubation period is 10 to 21 days. Viral exanthems that cause them usually aren’t treatable, but they almost always clear up quickly on their own with no long-term problems. Some serious bacterial infections also cause rashes, so it’s important for the doctor to evaluate an exanthem. Getting the proper immunizations can greatly reduce someone’s risk of many viral and bacterial infections. For mild symptoms, no treatment is required, as the rash and illness often last only a few days and then go away. Acetaminophen may be helpful in lowering the fever and reducing aches and pains. Drink plenty of liquids and get lots of bed rest. Viral exanthems are self-limited and minimally symptomatic to asymptomatic, treatment is occasionally warranted, either for the symptoms of the skin rash or for other organ involvement by the virus. A temperature over 101 degrees that lasts more than a day. A severe headache, stiff neck, confusion, unconsciousness, or seizures. Diarrhea and/or vomiting and severe abdominal pain. A severe cough or sputum with pus or blood. Spots, swelling, and redness on the palms or soles, blisters, swollen and painful joints. Red eyes, mouth, or tongue. The rash that is bright red and does not fade (blanch) with finger pressure.